Recommended by the renowned Arya Vaidya Pharmacy (Coimbatore) Ltd.
20 essential herbs in this bathing bar - handpicked by Vivel and The Arya Vaidya Pharmacy (Coimbatore) Ltd.
ITC Limited's leading personal care brand, Vivel, announced the launch of its new variant Vivel Ayurveda Essence in Kerala today. The skin nourishing bathing bar combines the goodness of 20 essential herbs renowned for skin health and care. India has a 5000 year old Ayurveda heritage which has been nurtured since time immemorial in Kerala. Vivel celebrates this tradition by introducing the Ayurveda Essence bathing bar recommended by the renowned Arya Vaidya Pharmacy (Coimbatore) Ltd. This recommendation bears testimony to ITC's relentless focus on product quality and innovation. Dr. Sindhu Sreejith, General Manager - Research, The Arya Vaidya Pharmacy (Coimbatore) Ltd. said, "Ayurveda is one of the oldest traditions of our civilization. Even today it is used for its therapeutic values the world over. We are extremely happy to recommend Vivel Ayurveda Essence which introduces a combination of 20 essential herbs known over centuries to keep skin healthy and clear." 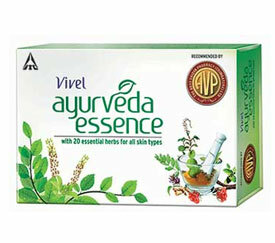 Vivel Ayurveda Essence, suitable for all skin types, is effective against skin problems. The bathing bar is enriched with the goodness of Vacha, Neem, Ghrat Kumari, Yastimadhu, Suwa Oil, Amahaldi, Godum Oil, Manjistha, Kapoor, Kapoor Kachari, Tagar, Mandukaparni, Gulab, Tulsi, Haridra, Chandan, Jaiphal, Khus, Triphala and Nagarmotha. Mr. Nilanjan Mukherjee, Head of Marketing, Personal Care Products Business, ITC Limited, said, "Vivel within^ 5 years of its launch has been ranked as one of the most exciting brands in India and has built a strong consumer franchise nationally. The recommendation of the Arya Vaidya Pharmacy (Coimbatore) on our latest offering Vivel Ayurveda Essence endorses our commitment to create hallmarks of consumer trust." Ms. Nikki Galrani, popular actress and Vivel's guest for the launch, said, "I am very happy and honoured to be a part of this event which celebrates one of our oldest traditions of well-being, Ayurveda! I invite you to discover beauty with Vivel Ayurveda Essence recommended by the reputed Arya Vaidya Pharmacy (Coimbatore) Ltd."
Vivel Ayurveda Essence priced at Rs. 22/- for 75g is available across retail outlets in Kerala. Soap business is no mean business. With increasing competition, it has become an area which not only needs innovation but also innovation to attract consumers' attention. At ITC, the endeavour has always been to accelerate growth by leveraging deep consumer insight and combining innovative and differentiated offers that deliver superior value to consumers. Q. What was the reason behind modernisation of the Vivel brand at such a short phase of its launch? A. At ITC, we believe in remaining contemporary and relevant, hence we are continuously refreshing our brand proposition in order to stay ahead of the curve. In the recent past, there has been an evident shift in consumers' attitudes towards their personal grooming and there is a growing need for multiple skin benefits from soap. In sync with this attitudinal change, we have fortified the already well-established brand of Vivel soaps. With the launch of the new skin nourishing range of soaps, we have evolved from just skin soft+ening to skin nourishment with vitamin E.
Q. What would the modernisation envisage for the brand? A. Vivel with its skin nourishing range modernises the well-established soap portfolio. Nourishment is the core brand thought. The genesis of this new platform lends itself to the finding that good skin is a manifestation of deep nourishment. The new range catapults Vivel's soap portfolio into a league of its own. The assortment of soaps introduces four innovative mixes of ingredients that have been trusted over the years for their skin care properties and vitamin E as the core nourishing ingredient for the range. Vivel with green tea, aloe vera, mixed fruit + cream and refresh + moisturiser with zesty orange extracts and milk cream is well poised to charm consumers and deliver consumer delight in every moment of truth. We are confident that the new portfolio will make brand Vivel even more endearing and will soon etch a distinct consumer need-oriented growth story in its segment. Q. How old is Vivel as a brand? Is it close to break-even as a brand? A. Vivel launched its portfolio in June 2008. In five years, Vivel has been ranked 4th in the personal care segment as India's most exciting brand (a survey by Brand Equity & AC Nielsen). It is estimated to have attracted an annualised consumer spend of Rs 500 crore and has strengthened its consumer franchise with one in every five households to have tried the brand. With the increasing urbanisation, favourable demographic trends and a strong proposition of nourishment across its portfolio, Vivel is poised to grow phenomenally in the coming years. Q. What is Vivel's current market share in the top categories? A. Vivel in its soaps' portfolio has garnered a strong consumer mindshare. In some markets, Vivel is well ahead of its well-entrenched competitors. The skin care portfolio, Cell Renew, was launched in December 2012 and has been well received. The range comprising body lotions, face moisturiser and hand crème has garnered positive reviews from consumers. Q. In what categories does Vivel operate? A. Vivel is present in bath care with its range of soaps and body washes, skin care with Cell Renew, Vivel Active Fair and a range of face washes and lip balm and in hair care with Vivel ultra pro anti- dandruff shampoo. Q. At what pace is Vivel growing its sales for ITC's personal care business? What is the revenue growth rate of the personal care business? A. Vivel has emerged as a vibrant consumer brand and is one of the ITC's fastest-growing FMCG brands in India with an estimated annualised consumer spend of Rs 500 crore in just five years. 10 May 2010 : Vivel Launches Deo Spirit to turn the heat on! ITC's personal care brand Vivel launched a new variant of soap 'Vivel Deo Spirit', today. This new variant from Vivel promises freshness that gives consumers the confidence to get close! Vivel Deo Spirit further expands the Vivel Soaps' portfolio. Each soap variant gives a specific skin benefit and offers a unique value proposition of bringing together ingredients that provide total care through nourishment, protection and moisturisation. Vivel soaps comprises a basket of variants which include Vivel Young Glow, enriched with Vitamin E* and Fruit Infusions for youthful glowing skin; Vivel Satin Soft, enriched with Vitamin E* and Aloe Vera for beautifully soft+ skin; Vivel Sandal Sparkle, enriched with Sandalwood Oil and Active Clay for clear skin; Vivel Silk Spring, enriched with Green Apple extracts and Olive oil, for smooth skin; Vivel Milk Cream and Glycerine for irresistibly soft+ and smooth skin and Vivel Ayurveda Essence, enriched with 20 Ayurvedic Ingredients to help protect skin from germs and harsh environment, to keep it healthy and beautiful.